Hello all!! 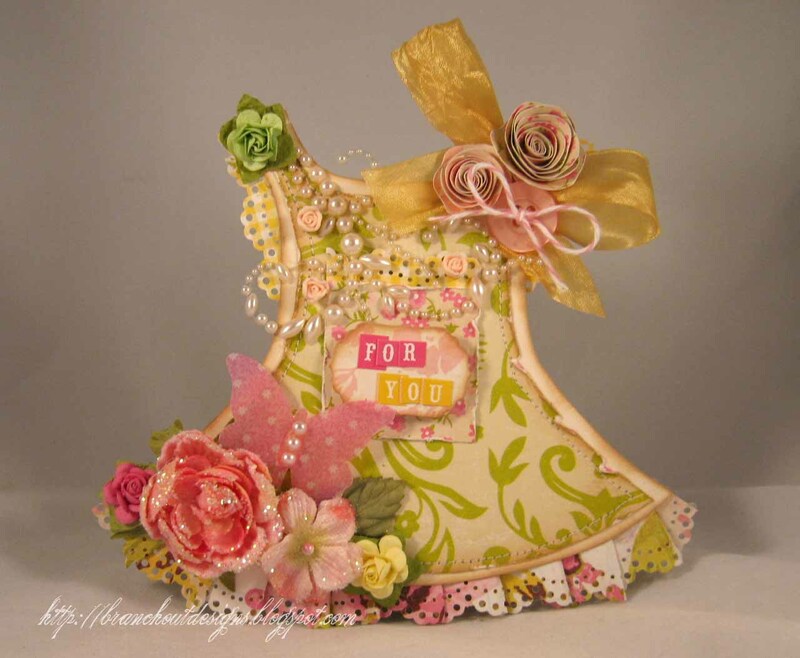 Welcome to our fifteenth challenge at Paper Therapy. Paper Therapy is an online forum for scrapbookers and card makers to share their work, meet new friends, learn new tips and techniques and have fun!! I hope you can join us every week in our challenges! The previous fourteen have been SUPER fun and we'd love to have you join us! This week's challenge was to make a shape card. That's right! No squares. No rectangles. At first all I could think of was die cutting a circle. But, then I started to think a little more out of the box (as I always tell my students) I finally came up with the idea of making a template for the front and back of this card, and the template was a little dress!! Perfect for any occassion!! When I showed my dh, he gasped with adoration which made me feel ohh so good. Sigh. I will miss running downstairs to show him my latest creation. At least I can Skype the card to him. I hand-drew a dress form for a template, then it out and stitched the front and back together. 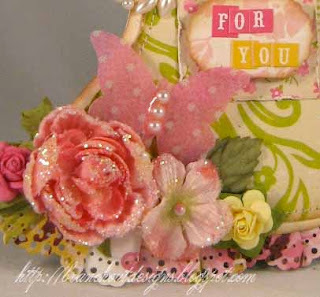 Added some more Prima flowers and a butterfly from Jenni Bowlin. Patterned Paper: (Green Brocade, Cabbage Rose and Shabby Rose from Paper Girl) The Girl's Paperie. Fibers: (Yellow Ribbon) Creative Impressions. (Pink and white baker's twine) May Arts. Accents: (Flowers and pearl flourish) Prima. (Pink button) PTI. (Butterfly) Jenni Bowlin. (Tiny type stickers) Cosmo Cricket. Other: (Border edge punch) Martha Stewart. 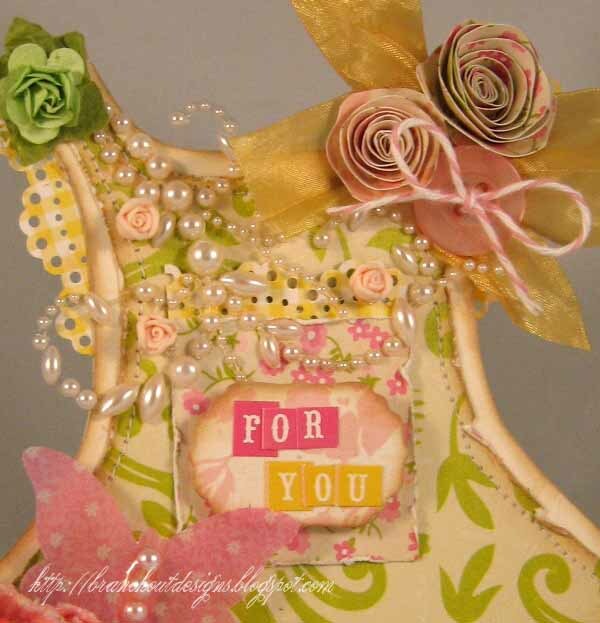 I think this is the most beautiful card I have ever seen!! Wow Emily! this card is fabulous in every sense of the word. The dress idea is darling, the colros are beautiful, the ruffle along the bottom is perfect and those flowers and pearly accents are TO DIE FOR! I love it! This is great Emily! I love the dress and all the embellies!! This is just absolutely amazing. The pearls, the flowers, just the whole thing - it's fabulously feminine and gorgeous!